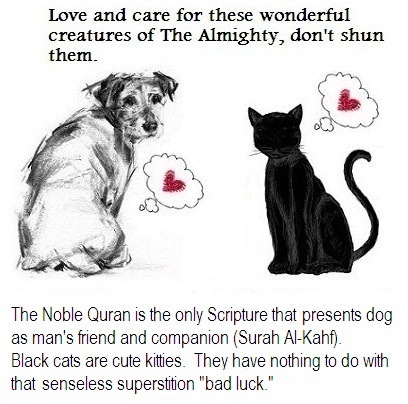 What does Islam say about dogs? So true sister. Lovely post. Adorable poster. Million thumbs up from me. I find many folks who are selective animal lovers. Some may love cats, take great care of them as pets and help homeless cats. But they treat dogs with disdain. Then again there are some with an attitude problem the other way round. We know a Syrian Christian family. They're ardent dog lovers but detest cats with the harshest of comments. All such buggers are hypocrites. If they really had compassion in their hearts for the sake of Allah, how could they ever display such heartlessly bias mindsets? Reminds me of the "cat man of Aleppo" in Syria. It's a great pic, ha !? 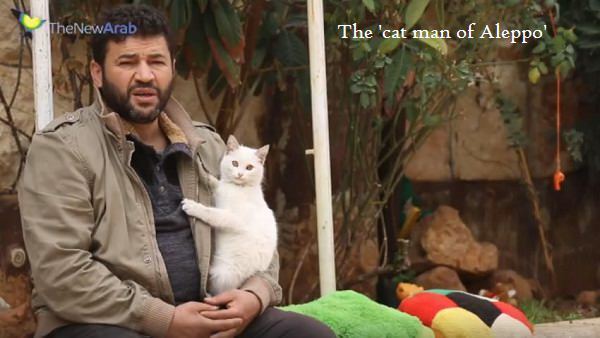 This guy's name is Mohammed Alaa al-Jaleel known as the "cat man of Aleppo." He's a paramedic by profession and been a cat lover since childhood. He built a wonderful sanctuary for homeless cats in Aleppo named "Ernesto." This santuary was damaged during the war and Al-Jaleel had to leave, taking refuge in some other part of Syria. He has now returned to Aleppo and has built another similar sanctuary for homeless, hungry and injured cats. That's truly admirable. But there are just as many hungry and homeless dogs out there who have also suffered immensely because of the war. But Alaa Jaleel never even speaks of dogs. I see a glaring double-standard in values here. These folks aren't compassionate in the true sense of the term; they've left their act of compassion incomplete. You're absolutely right Sister Heba. I so much agree with your reading of this aspect. Some (so-called) animal lovers present their affections in a very conflicting manner. If the compassion in their hearts is sincere, sprouting from kindness and tenderness within them with constant awareness of the presence of Allah, then how can their love for one pet and hate for the other co-exist as it often does which we see? Logically, such an attitude is utterly weird, contradictory and lacking in genuine compassion.